We meet at 10am on the Tuesday morning after the monthly WI meeting at various locations around the district. We announce our starting point at the WI meeting and on this website. We take a circular route for about an hour and a half and always stop for a refreshment break either during or at the end our walk. We have walked along the canal and the seafront in Hythe and have followed several different circuits around Saltwood and Brockhill Park. We are a friendly bunch who always discuss where we would like go for our next walk. We would be very pleased to see to some new faces. For more information speak to Gillian Chapman at a monthly meeting or use our contact page on the website. 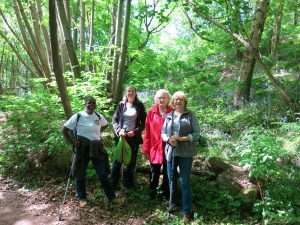 Some members of the walking group enjoying the bluebell woods around Saltwood during their May walk. In the lovely warm October sunshine seven of our members accompanied by one grand daughter enjoyed a very pleasant walk through the woods around Saltwood. We finished at the cafe in Brockhill Park where everyone enjoyed various hot or cold beverages. Nice to see some new faces and returned walkers on the walk, we very much hope to see you all again some time! On a bright and cold day in January five members enjoyed a brisk walk from Seabrook seafront up through the woods along the improved footpath to see the war graves in the Shorncliffe cemetery. Returning along the Corniche to the seafront and finishing with an excellent coffee in the Sandgate Hotel. 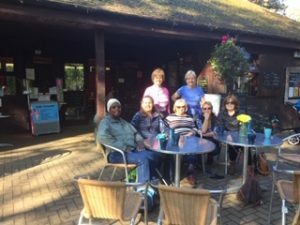 April’s walk has been postponed instead we will meet on Tuesday 14th May on Saltwood Green at 10am for a walk through the local woods finishing with coffee in Brockhill Park.